The National Marine Manufacturers Association approved a three-year strategic plan that will emphasize expanding its advocacy efforts, research, industry promotion and workforce development. 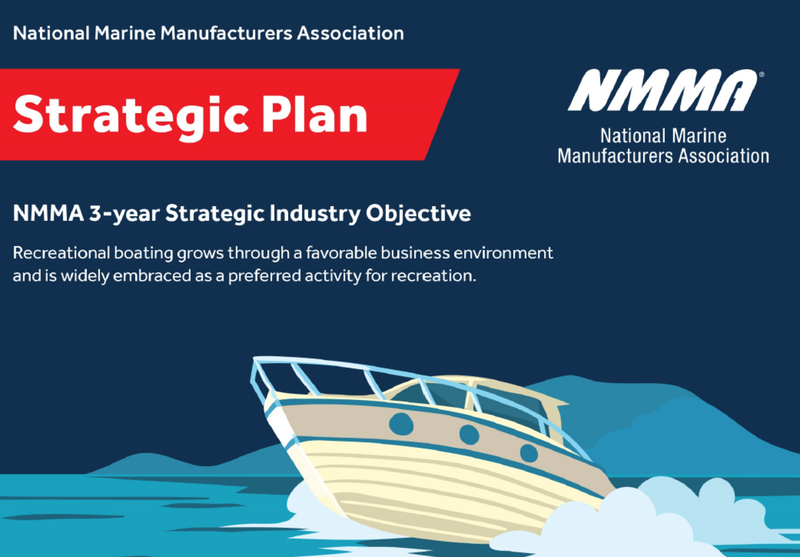 The three-year strategy was created by a task force of the NMMA executive committee, which comprises boat and engine manufacturers and board members, along with research provided by Robert Newsome, NMMA senior vice president of strategy, engineering standards and membership, and the association strategy firm Potomac Core Consulting. NMMA president Thom Dammrich said the process for developing the plan took 12 months. It involved interviews, surveys, analysis, brainstorming, meetings of a strategic planning task force and two long meetings of the NMMA board, division board members and Grow Boating board. “The insights we received from hundreds of stakeholders across the industry really drove the direction of the plan and gave us the information we needed to carve out NMMA’s primary areas of focus for the next three years,” said Bill Watters, president of Syntec Industries and immediate past chair of the NMMA board of directors, in the newsletter. The NMMA board confirmed its “core purpose” is to promote and protect recreational boating with advocacy and market expansion. It will continue with existing programs, as well as increase investment in advocacy at the state and federal levels, conduct more research and promotion focused on retaining and recruiting boat owners through its Discover Boating program, and backing workforce development initiatives. The NMMA hired two staff for its Washington, D.C., offices, including a federal lobbyist and communications professional. It also plans to hire two regional staff in the Great Lakes and south Atlantic for its state advocacy program. NMMA plans to raise funding for its BoatPAC political action committee to $500,000 per year, or $1 million per election cycle. Dammrich said the NMMA also will restore $1 million to Grow Boating in 2019 and “look to do more” in future years. Ben Speciale, president of the Yamaha U.S. marine business unit and chair of the NMMA board of directors, said the executive board “wasn’t surprised” by the committee’s recommendations. “Over the next few years, the strategic plan will guide the association as it works to continue growing and protecting the industry while acting as a blueprint for the association’s leadership team,” Speciale said. The Currents story included a link to a slide show of the plan’s recommendations.